Every organization spends money for various purposes, some expenses are incurred to gain more profits and some are for future profit requirements. Every expenditure has its own purpose from the business point of view and the classification between the capital expenditures and revenue expenditures is the most regular common problem for accountants since it has a significant impact on financial statements. 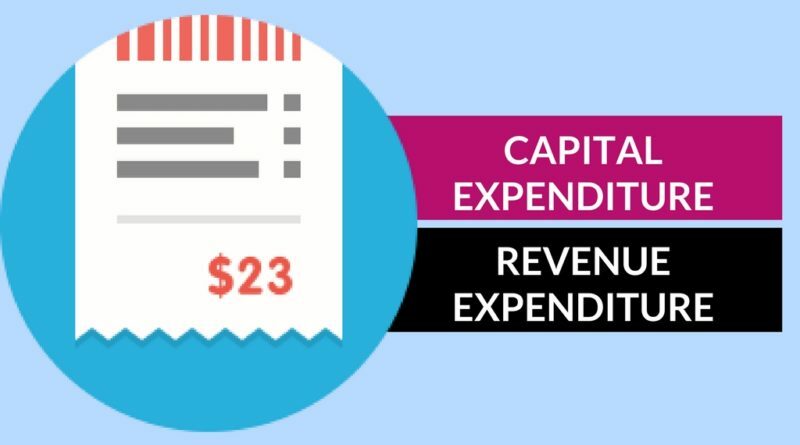 This article concentrates on communicating the difference between Capital Expenditure and Revenue Expenditure. Capital expenditure can be easily defined as money spent for purchase or creating of long-term assets such as building, furniture, machines, vehicles, etc. The expenditure made on the capital items is spread over several years. The capital items are charged depreciation for the time it is used. Capital expenditure increases the earning capacity of the organization. Capital expenditure always appears on the assets side of the balance sheet. Expenditure on capital items may represent the acquisition of any tangible or intangible fixed assets for future benefits. The benefits arising out of capital expenditure lasts for more than one accounting period. For example, the purchase of a truck to be use to deliver goods to the buyers is considered as capital expenditure. Some costs like legal costs of buying the truck, registration charges, installation of some accessories, etc also come under capital expenditure. Revenue expenditure can be easily defined as the costs incurred for the day to day expenses of carrying on the functions of business such as rent, wages, stationary, insurance, etc. Revenue Expenditure is an expense in the Profit and Loss account. The expenses which are incurred by the organization in setting the fixed assets in proper condition by maintenance and restoration activities are termed as Revenue Expenditures. The expenses for Ordinary maintenance and repairs of machinery are also classified as Revenue Expenditures. The expenses incurred for the purchasing of goods for resale and selling and distribution of the goods also comes under Revenue Expenditure. For example, the salary paid to the truck driver is considered as revenue expenditure. Some costs like maintenance costs for the truck, fuel costs, repair costs, etc also come under the revenue expenditure. Capital Expenditure is the expenditure incurred for the purchase of fixed assets. Revenue Expenditure is the expenditure incurred for day to day operations of the business and also for maintenance of fixed assets. Capital Expenditure results in the increase of earning capacity of the organization. Revenue Expenditure does not increase the earning capacity but helps maintains the existing capacity of the asset. The expenses made for capital items are recorded under assets side of the balance sheet. The revenue expenditure items are recorded in trading and, profit and loss accounts in the books of accounting. The benefits from the capital expenditure are spread over many years i.e. more than one accounting year. The benefits from the revenue expenditure are short term i.e. for one accounting year only. The capital expenditure is non-recurring and one-time in nature. The revenue expenditure is recurring and regular in nature. Money spent on the fixed asset when it is purchased is considered as a capital expenditure. Money spent on the fixed asset after it is used for a while is considered as a revenue expenditure. The capital expenditure results in the acquisition of assets and used for earning profits and sold when they become unfit for the business. The revenue expenditure does not result in the acquisition of assets and regarded as expenses for daily activities. The misrepresentation between capital expenditures and revenue expenditures will have a great impact on the soundness of the financial statements. Balance Sheet and the Final Accounts reflect a fair view of the financial statement of the business only when capital expenditure and revenue expenditure correctly represented. There is one more concept called Deferred Revenue Expenditure, It is usually treated as revenue expenditure but the benefit derived from this expenditure is not limited to one accounting year and it is of a non-recurring in nature and the expenditure is very large in amount, unlike revenue expenditure which is small.